Today’s post is all about my favorite quick meal that happens to be gluten free, dairy free, and totally delicious. Korean beef bowls, or Bibimbap, is a recipe I’m excited to share with you! Enjoy this American spin on a Korean staple. I’m a huge fan of Korean food. My husband and I had the opportunity to visit Korea during our college years. We almost didn’t leave because of the food. Shallow? I don’t care. Korean food is SO good. I’m certainly not an expert on making Korean food, but I do actually know what it should taste like since I’ve had so much of it. My favorite thing to eat in Korea was something called bibimbap (bee-bim-bop. It’s worth making it just so you can tell someone you’re eating that, right?) It’s a mix-up of different vegetables, meat, rice, and red pepper paste sauce. “Korean Beef Bowl” in very American term. Ha! From what I’ve seen, Korean food is made by cooking each element separate, and then mixing it together. So you would cook the meat, remove it, cook the onion, remove it, cook the carrots, remove it, etc etc. It’s absolutely beautiful in the end, but can I be honest? This mama ain’t got time for that! I want a meal that can be ready in 30 minutes, uses minimal dishes, and tastes darn close to the real thing. Mission, accomplished. This recipe uses some basic ingredients that you can find just about anywhere. Ground beef, onion, carrots, zucchini, and spinach. This Korean beef bowl (aka bibimbap) has all the flavor of the traditional dish, but with a very American twist on preparation. Toss it in and cook it fast. Using sesame oil will be a game changer in your homemade Asian cooking game. It does have a potent flavor, so a little goes a long way. But even mixing sesame oil in with another oil of choice will bring out the authentic Asian flavor you want. Sugar is a staple in many, probably most, Korean dishes (I was shocked with how much sugar I watched go into sauces and marinades…no wonder it tastes SO GOOD). I improvise with coconut sugar since it has a healthier profile. Honey or even date paste can be used, but I absolutely love the brown sugar flavor that coconut sugar brings to the dish. 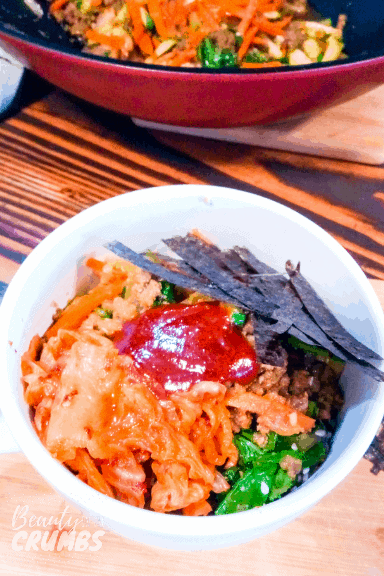 In bibimbap, a traditional red pepper paste sauce is used on top. This is optional, but not really if you want it to taste closer to authentic bibimbap. The red pepper paste that is the base of the sauce is usually made with wheat, but I found this brand that makes it with brown rice instead, so it’s gluten free. Soy sauce is also a sneaky thing with wheat. Most soy sauce is actually 60-80% wheat, but tamari is what I like to call “real soy sauce” because it only uses soy. If you’re gluten-free, you’ll need to get tamari. If you avoid soy as well, coconut aminos definitely taste like the next best thing! And coconut aminos is sweeter, which works great in this dish. Traditional bibimbap uses julienned carrots and zucchini. But because I’m a mom of four who is usually trying to make food in a hurry, I don’t have time to make perfect little sticks. My knife skills just aren’t that good. So I use a time-saving cheater trick. Slice the vegetables diagonally in 1/8 inch pieces, line those pieces up in a line, and quickly slice them into 1/8 inch pieces. Gordon Ramsey would probably yell at me for this. But it works to save me time here, and I don’t care if it’s not the right way to do it. Maybe you’ll find this time saving trick helpful, too! Not perfect, but close enough for me! The recipe calls for 1/2 -1 lb ground beef, (you can use ground turkey or diced chicken breast/thigh as well). We are a low meat eating family, so I try to use less meat and add in a lot more vegetables. We are fine with the half a pound, but you might want to add the full pound if you’re used to a more meat-dense meal. Traditionally, you can also add a fried egg on top. This is really good when the yolk is still all yolky and soft. It’s also a great protein boost if you use less meat like us! The last thing I want to add before jumping into the recipe is that this Korean beef bowl is traditionally eaten by mixing all the ingredients together. It looks gorgeous at first, but then is a big messy bowl of deliciousness. My advice is to stir it all up so you get that full experience. Just typing this up makes me want another bowl. I’m drooling over here. It really is one of my top favorite meals! Begin by cooking rice if you have not already done so. To prep the vegetables, cut onions into short 1/4 inch strips. After washing carrots and zucchini, julienne them. If you're not familiar with that term, it's basically making thin rectangular pieces, like large matchsticks. For my quick cheater version, slice them diagonally and then lay them in a line and slice again about 1/8 inch wide. Make the sauce by stirring together soy sauce, coconut sugar, and garlic. Set aside. In a large wok or skillet on medium heat, add the ground meat and onion and cook until meat is just done and onions are translucent. If you're using pre-cooked meat, just add the onion and the meat after the onion is soft. Turn stove up to medium-high heat and add in the sauce, stirring constantly as it gets bubbly. Continue cooking for 2-3 minutes until most of the sauce is thickened and evaporated. Push meat and onions to the side and add in carrots, stir-frying for 1 minute until just soft, then push aside with meat. Add in the zucchini and stir-fry for 30 seconds, moving constantly. Again, push zucchini aside with the meat. Add more oil if needed. Add in the spinach and stir fry until just wilted (this happens in seconds, y'all!). If using mung bean sprouts, add them here with a pinch of salt and stir fry with spinach until they're both just wilted. Mix all ingredients together quickly and remove from heat. Divide rice (or cauliflower rice) between individual bowls, and add beef mixture on top. Enjoy! It's traditionally eaten by the spoonful, not with chopsticks. So, DIG IN! Add 1/4 tsp to 1 T on top of beef mixture and stir whole bowl to combine. Start small and build it up. It's definitely a spicy sauce! But even a little bit adds so much awesome flavor. Store remaining amount in a jar in the fridge. It will keep for 9-12 months. Note: If you don't want to make much, you can easily halve or quarter this recipe. Prepping everything before you start cooking is key! It really cooks very quickly once you start, so make sure you've got the sauce and veggies ready to go.